We have been a Genuine Scooter Dealer since 2006. Just like you, we fell in love with their good looks, outstanding performance and remarkable reliability. We have specialized in selling Kymco and Hyosung Parts online for years and decided it was time to offer our services to Genuine Owners as well. 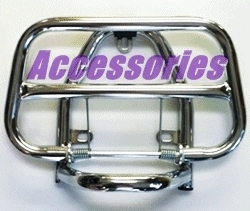 On this site we have original equipment (OEM) parts as well as original and aftermarket accessories. As the site grows we will add parts manuals, service manuals, and clearance items if available. We offer the most common parts that either wear out (filters, belts, brakes, etc) or that may break from the result of your scooter falling over. If you do not see what you need, just contact us either on the phone (928-778-7910) or via email. Thanks for taking the time to check out our site. If you have any questions, find a problem with the site, or want to offer up a suggestion don't hesitate to let us know.